Growing small businesses can face a number of challenges. These range from their own growing pains to the consistent competition from larger businesses. The obvious solution seems to be a paradox: the growing business needs to be able to do more with less – more leads and conversions with fewer resources and personnel. However, it’s not a paradox at all. Marketing automation allows you to save time, engage with and convert more customers, and to go toe-to-toe with your larger competitors. One of the most powerful reasons to embrace automated marketing is that it effectively levels the playing field and allows your business to compete with larger competitors. Once your team develops a “content strategy“ and commits to a solid “process,” you can use marketing automation to start generating more leads, and it will continue to do so, which allows your business to continue growing. Best of all, the initial time and planning you invest in an automated sales and marketing software pays off by automating some of your team’s tasks, allowing you to concentrate on getting even more done. This is crucial because, as Martech Advisor notes, 53 percent of small business owners say the most difficult part of their job is that they have to do multiple jobs … something that automated marketing can make a thing of the past! Just as you have evolved as a business professional, automated marketing helps your company adapt and evolve. Automated marketing allows your business to become more versatile and adaptable at almost every level. For instance, it helps you tailor your emails to unique client needs via targeted lists and to record in-depth email statistics to measure email effectiveness. Furthermore, it helps you track customer behavior regarding emails and to later send them content and communication relevant to what they were searching for, which increases customer engagement and conversion. Because marketing automation allows you to set your lead nurturing to specific times, you can have the best of both worlds by sending clients relevant emails often enough to maintain brand awareness but not so often that they get annoyed. The adaptability extends to prospects and customers visiting your site, too. Keep track of what they click on then place them on targeted email lists that offer them relevant solutions and information based on what website pages they were checking out. Alternately, you can send follow-up emails about specific products they seemed interested in. You can even use marketing automation to create dynamic content for site visitors, offering them content tailored to their previous visits or based on the search terms they used to find you. For all of the benefits marketing automation delivers your business, one of the most compelling reasons to embrace automating your marketing efforts is that it’s easy to start. Unlike complex, enterprise solutions, simple and intuitive sales and marketing platforms are available and enable you to run everything with your existing team instead of having to hire a separate team of IT experts to understand and use it. And, once you have set it to capture information on your contacts, it begins to run automatically, allowing your team instant access to important customer and prospect data. Best of all, marketing automation is a”cost effective” solution to grow your business-with it’s benefits far outweighing the investment. As a small business, your time is money. With automated marketing software in place, your business can put valuable hours back in your day. In fact Martech Advisor reports that marketing automation can save small business owners nearly $300 a day. This means that automated marketing can save you $1,500 every work week, and it does so while generating more quality leads and dramatically improving the experience you offer to customers. 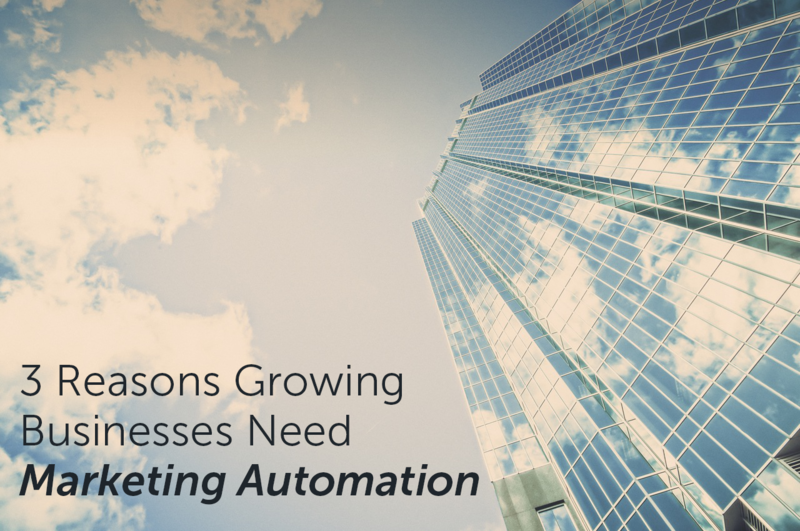 At the end of the day, marketing automation is one of the best investments you can make for your growing business. It helps you to communicate better with your contacts and turn more visitors and leads into customers. With the new breed of marketing automation tools upon us, small businesses can now tap into that same power big business benefited from for a fraction of the cost-helping your small business to take down Goliath and win more business.